Summary: When he was a child, Murakami was infatuated with a girl he called Kuroneko. She insisted on knowing about aliens and having met one, but no one believed her, even young Murakami was skeptical. One day, she decides to show him the alien, but an accident occurs and Kuroneko dies while Murakami is left seriously wounded in the hospital. Years go by and Murakami obsesses on finding proof of the existence of aliens because of a promise he had made with Kuroneko. Then, one day, a new transfer student comes to his class, who not only looks a lot like Kuroneko, but is named Kuroha Neko. First Impression: Good things in the future. Starting off right, and I've got everything that can be in its future in my pocket as long as they follow the script. First Opinion: Think Madoka Magicka, to the power of 10, if it's going to be anything like its manga, Kiwaguro no Brynhildr. It says something about its quality that as soon as I saw 'Brynhildr' I immediately jumped into every websites summary of it that I could find, and Fist Pumped when I knew it was based on what is one of my favorite mangas being translated right now. I've only seen episode one, but it follows the manga exactly. Now, if any of you read my first post about Golden Time, you may recall they did the same thing, but eventually changed things down the line. So why am I still so thrilled about Brynhildr? Because when you change plot elements in a romance/drama based story, you run a very high risk of diluting, weakening, or outright ruining the impact and quality of the story. In a story like this... as long as they're planning to stay the course for the essence of the story, (and the opening gives me great confidence they at least plan to), it doesn't matter how many minor plot or story elements you change, or how fast you clip the story down to size, it's still going to be a great show to watch. Obviously, anything can be ruined past the point of no return, but I have great hopes for this show. Now, something a bit more objective. 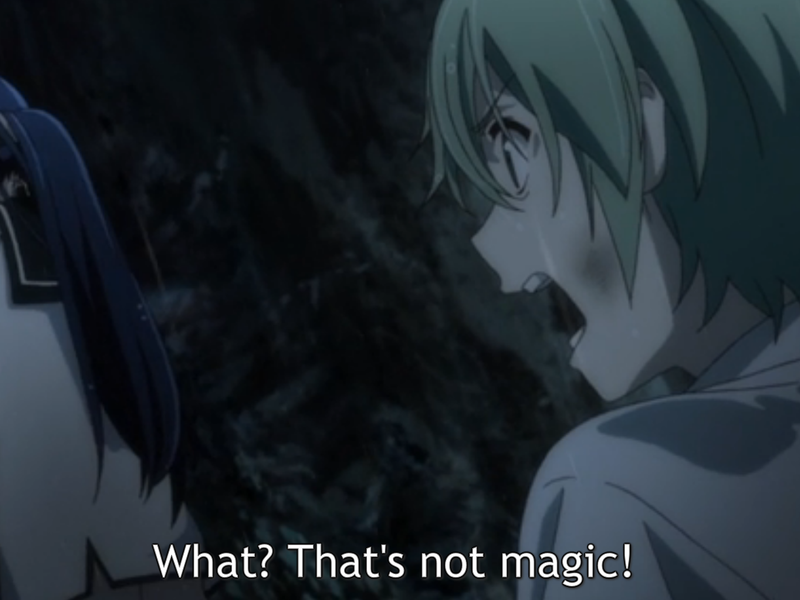 Whenever 'Magic' pops up in anime, it tends to immediately trigger the 'Magical Girl Show' stereotype in peoples brains. While that may not as be as deep of a stigma as it used to be post-Madoka Magicka, it still brings to mind the childish and shallow essence of the original stereotype, just slightly tempered. I've raved about this in a post before, only more generally on the topic of Fantasy, but to sum up fast: Fantasy(Magic) gives great power of reach and depth to a story and plot, but if applied too strongly, weakens it and makes it shallow. Why? When everything is solved in a one sided manner with 'The Power of Love/Friendship/Peace/Happiness' or other such nonsense, or the main characters have the power to reshape a quarter of the planet with a thought, but the fights still take 2-3 episodes, things get to feeling too absurd, even for animes powerful 'suspension of disbelief'. Enter the (I hope) upcoming trend I've likened to calling 'Modern Magic', and you have a potential solution. The basic essence of the idea, is that even Magic, if it existed in our world, would have its own Principles, Laws, and Physics that ruled it, even as it itself reshaped our vanilla Physics and Laws. In other words, its a higher minimum expectation of Fantasy(magic) as an enriching element, instead of a diluting one. Brynhildr may not quite fit into a 'Modern Magic' slot by technicalities, but if it plays its cards in the pattern of the manga, the rest of its world is going to fit into it perfectly even if the magic doesn't do so 100%. For a opening and first episode that promises to be true to the manga in spirit. Oh, and a word of warning: The squeamish may want to have a bucket nearby to lose their lunch in if the show doesn't pull any of its punches at all with the story.